About eight years ago I went to a Peace and Reconcilliation conference. It was hosted by a University in Queensland and this was obviously new territory. As you may have picked up from my blog, I am ALL about peace and recocilliation- they are topics near and dear to my heart. So I had answered a call to present a paper, although all these years later, I can't quite remember what I wrote that particular paper about. What I do remember was that they had invited delegates from different parts of the Pacific that had experienced recent conflict- Solomon Islands, Papua New Guinea, Fiji and Tonga. Having brought out these delegates, the organisers decided that it would be a fantastic idea to have a panel of Pacific delegates. As a Pacific Islander, and a person with a keen interest in Pacific history and politics, I was particularly interested in this session, although I didn't actually know what was being addressed, and the agenda item "Pacific panel" wasn't particularly enlightening. It was a year or two after the break down in law and order in the Solomon Islands, and the Regional Assistance Mission to the Solomon Islands (RAMSI) had obviously created curiosity and concern- the audience was packed. The lecture theatre was bursting with about 200 people as the Pacific delegates took the stage. A professor introduced the session explaining that the Pacific delegates had not been told what the question would be for maximum drama and effect so that the answers would not be practiced. The audience shuffled in anticipation. The professor pronounced the question with unseemly relish, "You are all from countries who have experienced some conflict, but what we would like to hear from you today is, how do you think Australia and New Zealand have treated their indigineous populations?" There was silence. Even all these years later I can still see the flashes of discomfort on the Pacific pannellists' faces before they schooled their features. A microphone was thrust into the hands of the delegate on the far left, who politely thanked the professor for the question, and for having her as a guest, and then said she did not have an opinion before passing on the microphone. Each pannelist took a virtually identical stance, some elaborating that they did not know enough about the history of the country in which they were a guest to venture an opinion. The Professor looked somewhat desperate. It was obvious that he had been courting controversy and had hoped to create a lively debate. He started trying to prompt and was met with polite and very patient repetition of their stance. I was outraged at the complete and utter lack of any culural sensitivity. I could not believe that the organisers had put the pannellists in this position- it was obvious that each of these Pacific Islanders felt it would be the very height of rudeness, to criticise the country that was hosting their attendance. As I was not a guest, I did not feel so constrained. I had that morning read an article about "stolen wages". From the 1890s until the 1970s the Queensland Government "controlled" the wages and savings of Aboriginal Queenslanders and Torres Strait Islanders. While it was hard to fathom, in 2003 people had still not received the wages they earned. The article in the paper that day related to the fact that the Queensland government had set up a scheme, a one-time offer, where if you had your wages stolen and you were still alive, you could have a one-off payment of $2000 and relinquish any claim to your actual wages and any interest that may have accrued. I cried when I read that article. I had heard so many Australians claim that whatever happened in the past was the past, that they could not be held accountable for something that previous generations had done. But this was not ancient history, it was a continuing injustice, it was happening that day. People who had been deprived of a way to generate wealth, a way forward, people in abject poverty were not being given what was owed to them (over two decades after it was owed), they were told to take the $2000 and be grateful. So I stood up and said I was Samoan and also happened to be Australian by accident of birth, and that I had only moved to Australia a couple of years ago, and that neither of my parents were Australian. Regardless of the fact that it was not my ancestors that visited these atrocities on the Aboriginal and Torres Strait Island people, each one of us who live in Australia today benefit from the fact that Aboriginal and Torres Strait Islander land was taken from them, and each one of us should take responsibility for what was not a historical issue but a current and ongoing one. That while I had only arrived in Australia, I recognised that, I felt reparations should be given, and I wanted to say "sorry". There comes a time in the history of nations when their peoples must become fully reconciled to their past if they are to go forward with confidence to embrace their future." This week is NAIDOC week in Australia. NAIDOC celebrations are held around Australia in July each year to celebrate the history, culture and achievements of Aboriginal and Torres Strait Islander peoples. 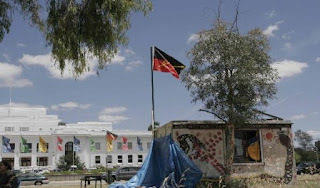 This year's theme "celebrates the champions who lived to renew the spirit of Aboriginal and Torres Strait Islander peoples through the establishment of the Aboriginal Tent Embassy in 1972. Forty years ago, the embassy became a powerful symbol of unity. Its founders instilled pride, advanced equality and educated the country on the rights of Aboriginal and Torres Strait Islander peoples. To move forward, we must acknowledge our forbearers, learn from their experiences and ask ourselves… what have their sacrifices meant for me and my family today?" I honour the spririt of struggle and perseverence in the establishment and maintanence of the Aboriginal Tent Embassy- it plays a pivotal role in the Australia that I wish for me and my small family to be a part of, an Australia that acknowledges the indigenous people of this land, and treats them equally. This country has been a land of opportunity and reward for me and for millions of other non-indigenous Australians. It should be nothing less for the indigenous peoples. This post is a small tribute to the indigenous people of this country. "Sorry" is only the first step. Good on you for speaking up in such a public forum! I feel for those on the panel who were put on the spot though - I can imagine how uncomfortable they must have felt. Thanks for a very sensitive and informative post. Thanks Reader, True confession- I was the geek that did all the speeches in school so had had some practice :-) Glad you enjoyed the post and grateful for the feedback. thank you teine samoa for sharing your thoughts on this topic. i haven't read or watched any doco's on the tent embassy (yet) but i will. i think it's fair enough to say the aust government & aust society as a whole has a long way to come in terms of righting the wrongs of the past. i was outraged when i read in your post about the 2thousand dollar stamp that was put on those who had been previously taken advantage of / wages with held etc. that's just insulting. Great piece. MOving and thought-provoking. Thank you. 5am in Samoa and knew i could count on something good to read on your blog! Thanks Joan- I like to remind myself that we are that society and each of our attitudes and approaches can make a difference. Thanks Lani, congratulations on your Samoan book launch! Next stop Sydney? *hopeful look* It's just lucky you checked on the one miracle month I managed to blog! Awesome read! I always envy those who were educated in Samoa and then on to NZ, Australia, England etc. For some reason, History taught in America seldom touched up on the lush history of Countries such as Australia and New Zealand or any Pacific Island Country. Honestly, it was only in College (University) that I was exposed to any history of the sort. Although very limited. I really enjoyed reading this post. Thanks for schooling the Yank! Thanks for sharing! Thanks @IT- I didn't go to school here in Australia so I can't speak authoritatively on the curriculum here but I remember a colleague who was about my age telling me she never knew nor was taught about the stolen generation, and it wasn't till she was in University that she realized there was a mission where stolen children were taken just outside the town she grew up in. It may have changed in schools now, I certainly hope it has because acknowledging all a country's history, both the good and the bad is so essential for moving forward. This is interesting. I was thinking of an article by bell hooks, 'eating the other'. this essay relates to post colonization and the cultural discourse that takes place when dealing with the 'other' (indigenous people). How there is a discomfort and denial when connecting with the past, thus we assuage the guilt through means of supposed 'good', by trying to reaffirm a positive relationship with the other'. "Oh no you DI'INTgo and make it all academic up in here!"